One of the good things about my move into the booze industry is that, surprisingly, the amount of booze I buy has gone down. Unfortunately, along with that the average price of things I buy has gone up. That said, looking for bargains has also become a bit of an obsession, which has led to my recent downfall: buying drinks in online auctions. I’ve been egged on by my evil cow-orker Tim who, having sat at the knee of our boss for the last few years, knows a few things about buying stuff from the block and has offered a guiding hand. Anyways, here’s a little bit of advice from a n00b to the world of auctions, as well as some pointers of where to look. My final bit of writing about port styles for the time being is dedicated to what I consider to be the most underappreciated style in the canon – white port. Produced in the same way to the various other ports in previous posts, but using a base made with white grapes rather than the red that the Douro is most well known for. 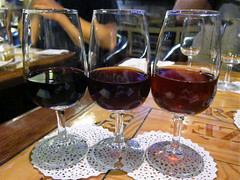 A variety of different styles of white port are made, mirroring the red varieties, but not much beyond young wine intended to be drunk cold or in mixed drinks makes its way outside of Portugal. Luckily the combined help of Vinologia, and the Ferreira and Sandemans port lodges helped me get a vaguely decent range of information and samples. I’ll leave most of my tasting notes on the young whites until the next post(s), when I’ll comment on the port lodge tours, but in short the ones I tried at Ferreira and Sandeman’s were medium sweet with a bit of citrus and honey. They weren’t really pushed by the lodges (although both tastings involved one as half of the pair of ports we were invited to try) and only really Ferreira (the more Portugese of the two) really gave them much time without me pushing for information. On top of the ones I had on the tours I did manage to sneak one in at Vinologia, although the waiter did seem rather bemused that I’d ask for a young white port when we’d been mainly drinking tawnies all week – I had the Dalva Dry White Port, served cold from the fridge. I can’t find much about Dalva other than it is now, after a number of purchases and takeovers, part of The Symington Group, along with Graham’s, Cockburn’s, Warre’s and Dow’s – four of the big lodges. On the nose it had caraway, unripe peach, peach stones and candy floss, and to taste it was lightly sweet with sour grapes and a biscuity finish. Not the most complex of wines, but nice and refreshing. However, once you leave these ruby equivalents behind things get quite interesting. Next up we have Lágrima, ‘Tears’. This is a very sweet style which our tour guide at Ferreira told us was named for the teary legs that run down the side of the glass after a quick shake of the sticky liquid. However, a bit more research on the internet suggests that there’s more to it than that, with the tears in question being the first juice of the grape pressing, released by just the weight of grapes in the press pressing down on those below and Lágrima being made from this free run juice. A quick look at the 1986 port regulations (even if google translate does a bit of a mangling) suggests that Lágrima is merely a sweetness category, sitting at the top of the sugary side of things along with Very Sweet (multo doce). Primed by the Ferreira tour to look for some Lágrima we were yet again looked after by the folks at Vinologia who passed a glass around our table so that we could have a taste. Unfortunately I didn’t note which wine it was, but it was served very cold and sat quite syrupy in the glass with little smell. To taste it was thick and syrupy with a surprisingly delicate taste – floral in a similar manner to some light dessert wines. It was rather pleasant and at least one member of our party picked up a bottle as we passed through the airport. It’s a very Portugese style of port and not one that finds its way out of the country very often, so I’ll probably have to wait until my next visit to investigate further. The other section of the white port spectrum that I tasted seems to be all classed under the banner of “Old White Port”. From their colour and a couple of conversations with people in Porto and since these are generally aged in the same manner as Tawnies and Colheitas, in oak casks. With everyone else sticking to the red wines I thought I’d try and help round out the side with some white port drinking and after my first glass I was happy to continue. Very much more towards the style of Tawny ports than the white ports we generally see in the UK, these were rich, sweet and complex but without so much of the red fruit that I often found a bit overpowering in the red ports. My first glass of port after arriving (apart from a welcoming glass of ruby at our hotel’s reception) was in, as you’d expect, in Vinologia on our first night on a quick recce before bed – Messias Old Dry White Port. Messias are a fairly young company, starting in 1926, and produce a variety of wines with port being only a small part. From a quick look around their website I’m assuming that the wine for their white port comes at least in part from their Quinta do Cachão, whose single quinta 1990 LBV I also tried. This was my introduction to older white ports, coming in at about 15 years old, and it was definitely a good start. It was a dark bronze, more a whisky colour than what I expected from port, and had a nose of light raisins, floral syrup and a slight mustiness backed up with some rich PX sweetness. To taste there were sultanas, sweet honey and lightly toasted bread. Much less in the way of jam than red ports and with some hints of sweet but old sherry. On my next trip back to Vinologia I plumped for an old white port flight to start and ended up with three of the finest white ports available. 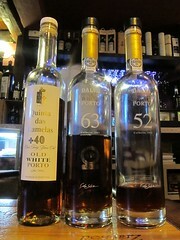 I started with the Quinta das Lamelas 40+ Old White Port. Called 40+, as there is no older category, this was a good dark brown (at this age the Tawnies start to lighten and go brown and the whites are dark and brown – it was sometimes hard telling them apart from appearance alone) and had a nose of rich PX and Vicks vaporub. To taste there was lots of rich fruit as well as black liquorice, celery, cloves, sticky cherries and pine. A totally different beast to the younger ports. Next in the flight was Dalva Golden White Port 63, a white 1963 colheita. This wine was bottled in 2009 at 46 years old and was, as the name suggests, a good golden colour. On the nose it had light honey, sweet caramel and some menthol. To taste there was a distinct woodiness that I’d not tasted in a port before, raisins, cranberries and a touch of caraway, with a bitter wood finish. 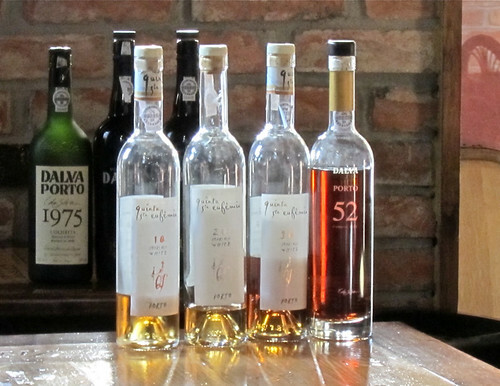 The last of my three was Dalva Golden White Port 52, a 1952 colheita also bottled in 2009 for a total of 57 years in the barrel and announced by our waiter as ‘the best thing we have’. On the nose this had a very floral burst of alcohol, perhaps violets, followed by fake strawberry and cherry, and light menthol. It was a syrupy in the mouth and had cloves, cinnamon toast and lemon lockets to taste, with a finish of toasted bread. It was quite impressive and I’m kicking myself that I didn’t get a bottle to bring back to the UK. 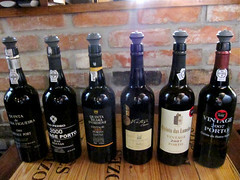 I’m fairly sure I tried a flight of the Quinta Santa Eufémia ports, running from 10 years old to 40+ as well, but I can’t find any notes and it was 3 months ago now that I visited – the main thing I remember was that they convinced tawny lover Bob that there was a chance that white port might be vaguely drinkable (an impressive leap for a white wine hater such as him). UPDATE: It seems you can get white port in the UK, although not quite as much you can find in Porto. The lovely folks at Portugalia Wines, who happen to be based around the corner from my office, have some Quinta Sta Eufemia port and thanks to them I have a bottle of the 20 year old sitting on the table at home. 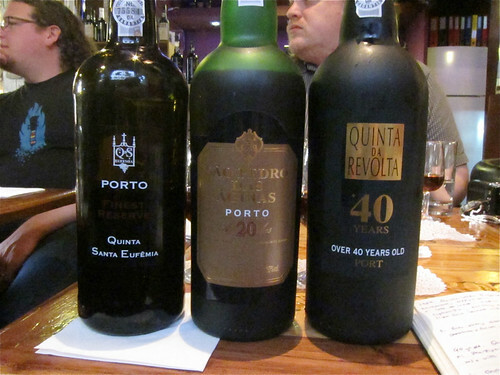 The next group of port styles that I’m going to talk about is the oxidised pair of Tawny and Colheita. These again start from the same root as the other ports (as described in my first porty post) and then both continue from there in pretty much the same way. Once the wine has been fortified and rested it is filled into oak casks which have already been used to mature regular table wines. As it sits in the porous casks the wine pulls flavours from the wood as well as oxidising and reducing in volume due to evaporation, giving quite different flavours to the ruby/vintage process. As the wine ages it also loses its red colour, becoming browner, and the flavour adds wood and ‘nuttiness’, losing some of the rich red fruit sweetness that you get in unoxidised ports. It was described to us on the Ferreira tour as being a much more Portugese style of wine, different to the traditionally up front sweetness of the ruby ports that suited the British palate and drove the early days of the port trade. 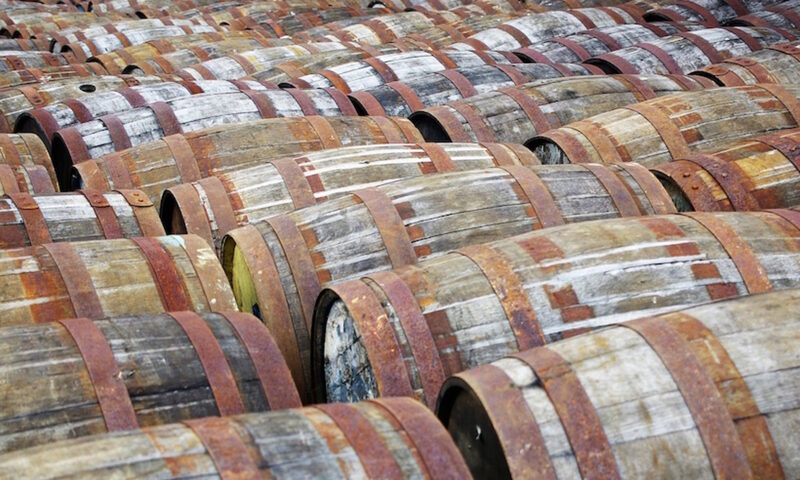 One of the differences between barrel aging port and spirits is that the barrels are routinely cleaned – the barrels are dumped into vats (blending the individual casks together, removing the concept of single cask ports) and they are spray washed to remove the sediment that drops out of the wine as it sits. The sediment removal can become quite important as while the wine doesn’t have to sit in the barrel for too long it can be aged for upwards of 60 years. It’s around the combining of the wines and calculation of age that tawnies and colheitas diverge – tawny is a blend of ports from various vintages, but colheita is a single vintage aged in wood. Tawnies have their ages listed in increments of 10 years, with the official categories being no age (I’m not sure how long this has to mature), reserve (at least 7 years), 10, 20, 30 and 40+ years. The numbered ages are referred to as ‘Tawny With An Indication Of Age’ (TWAIOA) and the figure isn’t exact, representing the ‘character’ of the wines wines blended together to create the bottling, generally a bit lower than the average age, leading to some very old wines being labeled as 40+. This may be accurate, but can be slightly misleading as very old wines blended together exclusively from tawnies over 40 years old still can’t be specifically labeled as older than 40+. Colheitas are made up of ports of a single vintage aged for at least 7 years, making them the tawny port equivalent to ruby’s vintage. So while the individual casks will be blended together (at the end of maturation as well as during the yearly cleaning cycle) all the port comes from the same year, although as far as I can tell these are not necessarily declared vintage years. As with vintages single quinta wines do appear, with all the grapes going to make the base wine coming from a single vineyard. The first tawny I tried on the trip was Casal dos Jordões 10 Años. Casal dos Jordões has been around since 1870, are based around São João da Pesqueira at the east end of the Cima Corgo and have managed to grab the rather useful domain name of WineDouro.com. Not knowing entirely what to expect from tawny port I was rather pleased with this as an opener. The nose was rich with fresh ripe cherries and a hint of cloth sticking plasters. To taste it was big and sweet up front with lots of cherry – cherry lips, cherry menthol sweets and cherry jam. There was a nice hit of booze as well as green herbs, a hint of spicy chocolate (Green and Blacks Maya Gold?) and a PX-like thick raisin aftertaste. A good start. Other than random glasses I tried a flight of old tawny ports, again matching up with my table buddy to get in a wider range of ports. First in my flight was the Quinta Santa Eufémia Tawny Finest Reserve, a single quinta made from wines averaging about 7 years. 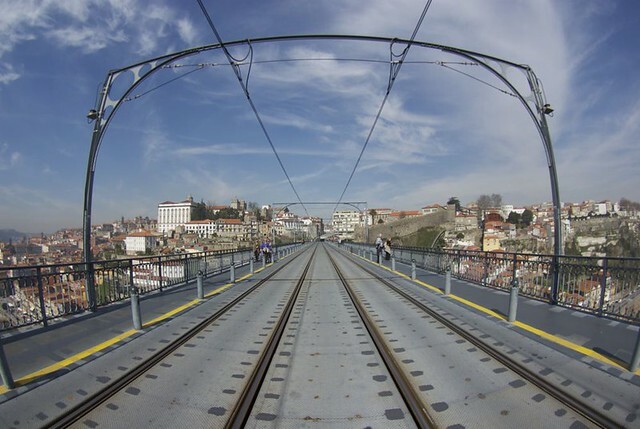 They have a website and are based on the south bank of the Douro near to Pasa de Régua. On the nose it was very young smelling, with only light fruit and a slug of alcohol. To taste thought it was very fresh and fruity – quite a difference from the heavier tawnies that made up most of the selection. The flavour was balanced between sweet and sour, cutting the red jam flavours with a hint of sour fruit skin. There wasn’t a lot to it, but it was easy drinking and a good match for a warm day. Next was a São Pedro das Águias 20 year old Tawny. I mentioned their 2000 vintage in my last post and after some more looking still can’t find anything about them. This was a very transparent reddy brown in colour, definitely losing the deep red of the rubies, and had a nose with hints of wood, dry dried fruit, raisins and hints of almonds. There was the ‘jamminess’ that I’ve been finding in ports, but this time much more towards a sour fruit jam, without as much sweetness. To taste it started sweet and moved quickly onto a big spicy middle with cinnamon and allspice. The body had raisins, thick PX and a hint of bread, reminding me of Eccles cakes. These flavours faded quickly into a lightly woody finish with little alcoholic burn, making it worryingly drinkable. The last of my flight was Quinta da Revolta 40+, which according to our hosts had spent the best part of 60 years in wood. The quinta was founded in 17th or 18th century and is at the east end of Porto itself, on the north bank of the river in Campanhã. This was the oldest tawny that Vinologia had and it had lost most of its ruby colour, sitting a deep brown with just hint of red when held to the light. On the nose it had big rich PX-like fruit (molasses and raisins) with a light menthol and general medicinal note, but still quite fresh. To taste it was thick and heavy with raises and sour red grapes almost swamped by honey and caramel. There were occasional flashes of tannic wood and the finish was long and orangey – ‘Like a sliced orange flambéd with brandy’ say my notes. The first of my neighbour’s I tried was the Quinta das Lamelas Tawny Reserve. This was the youngest tawny I tried, produced by the quinta I tried most wines from, and it was recommended to us due to being very different to most on the Vinologia menu. That difference was noticeable immediately from the nose – oranges. Bitter Seville orange, sweet orange peel, Grand Marnier and an almost fake orange candy smell, all quite light and fresh, combined to smell entirely different to all the other ports we’d tried. To taste it was again citrusy, although not as much as the nose suggested, with sweet orange balanced out with bitter, and there was a light raisiny sweetness hiding underneath to remind you that it was port. A strange one. Next I borrowed a taste of a San Leonardo 30 year old Tawny. I say ‘a’ but from the page I’ve found online about it this may well be a ‘the’. Bottled around 2006 and with a chunk of the wine being laid down to mature in 1972 this seems to be a single pipe (a tall and thin ~110 gallon barrel traditionally used for port aging) with (I assume) some extra wines blended in, preventing it from being called a colheita. São Leonardo is a ridge north of the Douro river near the town of Galafura, and I assume that the wine is named for the area. On the nose my notes say “PORT”, with the capitals being important – this is what port smells like in my brain. There was a medium red wine base with red berry sweetness, a thick jammy centre, and a light lick of alcohol. To taste it was really sticky and jammy, with savoury wood balancing that out. The finish was lightly sour underneath, but with rich fruit and caramel lingering around as well. Amongst the various other tawnies I tried from other people the one that stood out to me was the Noval 40 Años. Quinta do Noval is in the central port producing region of the Douro valley, the Cima Corgo, and has been operating in its current form since 1894, when it was bought by Antonio José de Silvá shortly after phyloxera had ravaged much of the Douro causing many vineyards to be sold. They now mature their wines at the quinta, formerly keeping them in Porto until a few years after the laws governing the designation of origin for port changed in 1986 (which from the 1986 document and some other pages I’ve found suggest that port had to be shipped through Porto). The wine itself was interesting – the nose was both sweet and earthy, with cherry Tangfastics, Luxardo cherries, woody menthol, cedar and almonds. The taste was rich and fruity, with sticky glacé cherries and sour red fruit leading to lingering green wood and cherry strepsils. 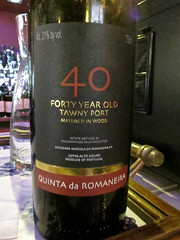 The other old tawny that I tried was Quinta da Romaneira 40 year old. Romaneira is based near Pinhão and was recently purchased by an investment group headed up by the managing director of Noval. Along with the vineyard they seem to, from the rather contentless but pretty website that searching for the quinta name directs you to, have a luxury hotel overlooking the Douro. On the nose this one had marzipan, a hint of salt and sponge cake batter with fivespice and mixed peel (my favourite cake from childhood in its uncooked form – this port invoked memories of licking the cake mix bowl in an excellent burst of sense-memory). To taste it was big and christmas cake-like, with dried fruit and nuts, sweet marmelade and apricot jam. I also tried a few colheitas during the trip, starting with Romariz 1979. Originally well known for their wood-aged ports, Romariz are now part of the Taylor’s/Fonsecca family, have expanded their range a bit and draw their base wines from the Cima Corgo. This wine had a strangely savoury nose, a cross between sweet jam and worcester sauce. This didn’t continue much into the taste, with menthol joining rich fruit as well as woody spice, tobacco and a sharp wood bitterness. The only other colheita that I have notes on (other than a couple with ‘pressed raisins. nice’ beside them) is the last port I drank – the bottle that the folks of Vinologia found hidden on a shelf that they’d forgotten about, Valriz 1958. I tried Valriz’s 1982 LBV in my last post and this wasn’t much older in terms of active aging, bottled in 1984 for a total of 26 years in wood. It had lost almost all of its red hue and sat in the glass a rich amber brown. On the nose it was musty with cheese rind, salted almonds and the ever present raisins. To taste there was stewed fruit, more cheese rind, a hint of wood smoke, orange peel, red boiled sweets and toffee apple caramel. The finish was quite long, with the almonds of the nose appearing as lightly sweet marzipan. Ruby is the most common and generally cheapest form of port. When the wine arrives at the producer it is decanted into large vats or tanks of stainless steel, concrete or wood, where it is left for at least three years before being fined, filtered to remove any sediment, blended to maintain the house character and then bottled. The large storage containers mean that a smaller surface area is exposed to the air leading to less interaction with oxygen, so that the wine keeps its colour and also doesn’t change its flavour too much due to oxidisation. As the wine has been filtered it won’t change much in the bottle and isn’t consequently aged, leading to the cheaper price. Vintage port takes the idea of ruby further by reducing the oxygen exposure even more. After an initial aging (in vat or barrel) of up to 2.5 years the wine is bottled unfiltered and then left to continue maturing under glass. The yeasts and other sediment allows the wine to develop over the years, often taking decades to reach its peak. 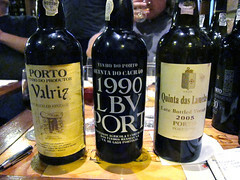 In addition to this length of time before drinking the amount of vintage port produced is further restricted by the Instituto dos Vinhos do Douro e Porto (IVDP), the body that governs port production, both by regulating whether a port can be called a vintage and also by restricting the quantity of port that can be produced as vintage. In the spring of the second year after harvest each port house can choose to declare a vintage, at which point samples of the ruby port that they have been maturing with an eye to becoming a vintage are sent to the IVDP for quality control. If the IVDP accept the declaration then the port is bottled and left to mature. Vintage declaration doesn’t happen universally across all the port lodges in any given year, as it depends on the quality of the harvest in the house’s vineyards and wine that they have produced. Generally it happens a couple of times per decade for each house, although some declare more often. The third related type is Late bottled Vintage, and these wines can be further split into two styles. They both start from the same place: wine from one year that has been matured in vats for longer than usual (4-6 years) is selected and bottled. 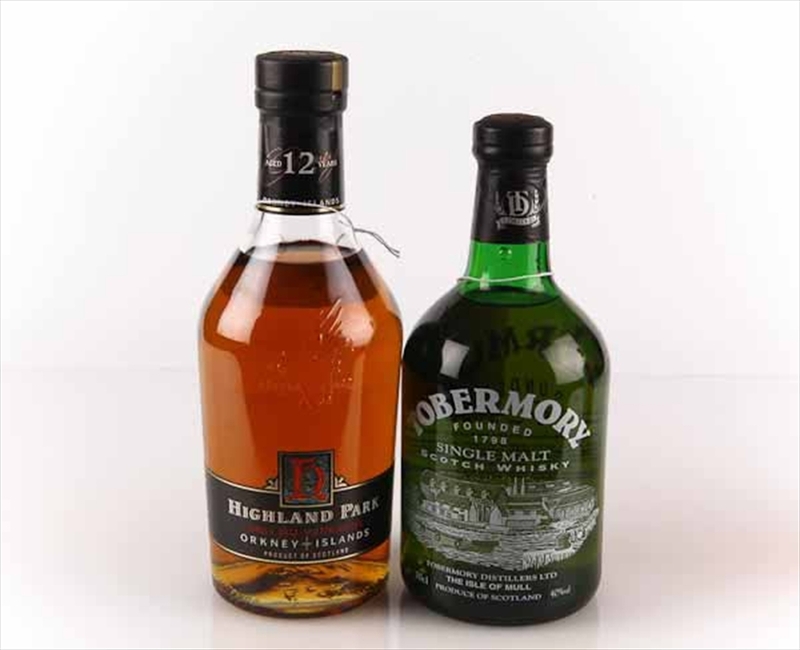 The difference between the styles is that one is filtered before bottling and one not – the former will continue to develop in the bottle due to the sediment while the latter will be a more oxidised ruby. The trick with LBVs (with thanks to our guide at the Ferreira port lodge for the tip) is to buy unfiltered ones that are from the same year that the producer declared a vintage – the port is more oxidised, giving a different character, but if the base wine is good enough to be declared as a vintage it’ll probably make a good LBV. The fact that they are cheaper than vintages and are ready to drink earlier can’t hurt. Other than the development in the bottle the main thing about the unfiltered wines, both vintage and LBV, is that they will contain sediment. As such they should usually be decanted to make sure that you don’t get too much of it in your glass, with the other intention of getting some air into the less oxidised wine to ‘let it breathe’. Sediment or no, these wines also don’t last as long after opening the bottle, as they will oxidise quickly, and not in the good way that I’ll talk about in the next post, although the higher alcohol content than unfortified wine should give a few days before they go stale. On top of the general style classifications comes the concept of ‘single quinta’ wines, the quinta being the grape producer/vineyard. Rather than blending together wines from a number of vineyards, as as with most ports, the single quinta varieties are made from the grapes of one. For vintages this will generally be the best wines. The first wine was a Quinta das Lamelas LBV 2005, a single quinta (as all of the ports naming the quinta seem to be) LBV that I assume is unfiltered (although as they weren’t decanted I’m not sure). Annoyingly I can’t find out much about the producer, especially as a bunch of their ports appeared during my trip, other than that they are probably (based on the names of some holiday accomodation) based around the town of Pinhão, one of the main centres of wine production in the Douro, and (from a now missing snippet on a google page) owned by João Guedes (a name attached to a number of people from actors to bankers to surfers). 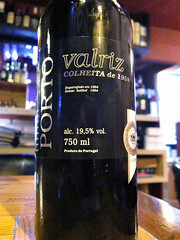 The port was a deep opaque red and had a nose of dry red fruit, light sweetness and some tannins. To taste it was nicely balanced between sweet and sour, with lightly sweet fruit and a woody finish. The second was Quinta do Cachão LBV 1990. From what I can find online the producer is Sociedade de Agrícola e Commercial dos Vinhos Messias, based in Vila Nova de Gaia, and Quinta do Cachão is one of their prize vineyards that they produce their single quinta wines from. It was more transparent than the Lamelas and was purpley red. On the nose there was a hint of struck match sulphur, a soft fruitiness, light honey sweetness, red wine gums (both the fruit and waxiness) and freshly lit bunsen burner. To taste it was rich and much more consistently flavoured with a light alcohol burn. There was a touch of wood, liquorice root and sticky red boiled sweets balanced by sour wood. The third of my flight was a 1982 Valriz LBV, produced by Aida Coimbra Ayres de Mattos & Filhos in Galafura in the Baixo Corgo. It was a translucent browny red and had quite a light savoury nose with a touch of sugary sweetness, light menthol and honey. To taste it was thick and fruity with buttered brown bread, with berry jam and a ripe grape finish – like a jam sandwich. They had six vintage ports which we could choose from for a flight and I decided to slew towards the younger ones to try and see what the older ports develop from. 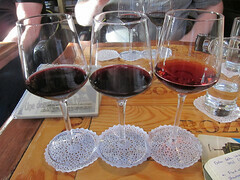 The first for the vintage flight was the 2007 Quinta das Lamelas. The same quinta as the 2005 LBV I tried, this was quite different. The nose had Cherry and blackcurrant Tunes, a hint of sour tobacco, a light spice and a touch of red jam. To taste it was pure concentrated cherry (cherry jam and Luxardo cherries), ebbing away through a clean alcoholic hit. Next was 2003 Quinta Seara d’Ordens, a small producer based north of the Douro near Poiares. They’re different to the other independent quintas that I’ve looked up so far in that they have their own website with a bunch of information about their history and wines. This port had a lightly tobaccoey nose, with dry red wine and cranberries. To taste it had more sweetness, with a bit of fresh cherry leading to a lightly wooded finish with a noticeable boozy burn. The last entry in my vintage flight was 1989 Quinta de Val da Figueira. Again I can find nothing about the producer, with different webpages giving addresses in Pinhão and Porto, but as Vinologia specialises in the smaller producers this is not that much of a surprise. On the nose it had lots of wood (old cedar and oak cupboards), earthy smoke and lightly fruity berries underneath. The taste was grounded with a rich sticky cherry base, over which there was a chunk of wood surrounding a meaty middle. Over the 20 years of aging the port had lost a little of it’s bright red hew and gained some translucency – markedly more than the other wines in my flight. This, along with it not tasting quite as good as it had on one of my travelling companion’s previous visit to Porto, made us think that maybe it was a slightly dodgy bottle which had got a bit more air in through the cork than strictly necessary. There was quite a lot of coordination in port choice between the various members of our party, as getting the widest range of wines out so that everyone could have a taste was our long decided plan, and my tablemate Phil also went for a flight of vintage ports. While we both jumped on the 1989, as it was the oldest vintage that was served as part of a flight, he chose a more sensibly varied range, picking a different 2007 and a 2000. Phil’s first was 2007 Quinta de Retiro Novo, described by the barman as one that ‘has potential’. The quinta is owned by Wiese & Krohn and found near the town of Sarzedinho. Output is small and of high quality with production split between port and Douro wine production, with some of the top end wines still being made from foot trodden grapes. The nose on this was of sour red wine, tannic winey wood, strong tobacco (reminding me of the Drum/Duma I used to buy when I smoked roll-ups) and dried coffee cherries (a mix of leather, sour red fruit and coffee – I only know due to the bag I got as a bonus in an order from Square Mile Coffee). To taste it was much more restrained and simple than the nose – light cherries sweeping along to a woody end. Next was 2000 São Pedro das Águias, another quinta that I can’t find much about online. The nose on this one was quite different to the others, with long stewed eccles cake raisins, dark chocolate and concentrated raspberry jelly cubes. To taste it was much lighter (as with a lot of the vintages we tried) with glacé cherries, although it did have a big jammy middle and syrupy mouth feel. While vintages are the most lauded type of port, it’s the LBVs that interest me the most – I don’t have the patience to wait for a vintage to reach its peak (or the funds to buy ones that have already got there) but filtered and unfiltered LBVs from declared vintage years offer a chance to get a ready to drink or faster maturing bottle from those vintage years for a reasonable price. However, oxidation very much has its place in port maturation, which I’ll go into in my next post. My inability to organise travel, amongst other things, is well known amongst the lovely people I refer to as ‘friends’, with my habit of constantly changing my mind and not being able to make simple decisions (such as ‘which hotel do I stay in’ or ‘ where do I go on holiday’) leading to a decent knowledge of the five or six places I wander around near my house rather than places further afield. So, when I was part of an email chain that started with ‘I think we should go to Porto’ and swiftly, with a mere ‘Yes, that’s a good idea’ as my only input, to ‘we’re staying in this hotel on these days, click this link to book a plane ticket’ it ticked all of my dream holiday boxes – someone else did the organising and they chose somewhere with interesting booze that I don’t know much about. Port, or Port Wine as the locals (when talking English) refer to it, is a fortified wine produced along the Douro river in northern Portugal. It has a Protected Designation of Origin and only wines produced in Portugal can carry the name ‘Port’. The Douro wine region itself has a protected Appellation and has since 1756, making it one of the world’s oldest protected wine regions. The history of port is quite closely interwined with England and our two traditional loves – drinking and warring with the French. In the early 1700s England was, as usual, at war with France which curtailed our importing of French wines. After the signing of the Methuen Treaty in 1703 the lack of taxation on Portugese wine led to it becoming rather popular and Douro valley wines started flowing to England via the port at the mouth of the river – O Porto (The Port). However, as the trip from Porto was quite long the wines often spoiled and the cunning winemakers started fortifying it to make it last longer. 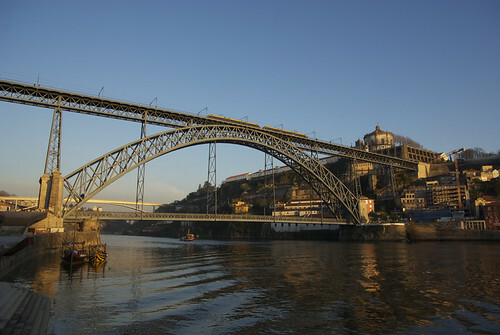 The UK connection continued with British traders setting up shop in Porto, buying and selling wines for import, and over time turning into the port producing companies we find today. This is the reason why we now don’t see many Portugese names on bottles of port, but the likes of Cockburn, Dow, Taylor and Sandeman are well known. Baixo Corgo – the most westerly region. It has the most variable climate and produces wines that mature faster. It’s also the region with the longest wine production history. Cima Corgo – the middle region. Has more rain and produces wines suitable for longer aging. It’s the largest region by area and amount produced, and is genereally considered to produce the best wines. Douro Superior – the eastern region. The hottest, driest and least humid region, stretching to the Spanish border. The wines from here are more extreme, with some very intensely flavoured produce. It’s the youngest of the areas and while it does produce some good wines many are blended with those from the other regions. The methods of growing are still very traditional, with the steep sided valley being a natural match for the terraced vineyards which stretch along pretty much the entire length of the river. The nature of terraced viniculture does mean that mechanisation is difficult and much of the work of maintaining the vines, harvesting the grapes and transporting them for processing is still done by hand, with workers carrying large baskets of fruit up and down the terraces after picking in September. The grapes are crushed locally and the initial fermentation happens along the lines of normal winemaking. However, after a short ferment in stainless steel tanks of only 2-3 days the wine is fortified with a 77% ABV neutral grape based spirit called Aquardente which kills the yeast and stops the fermentation process. This early finish to alcohol production is balanced by the greater volume of fortifying spirit that’s added, unlike with dryer sherries where the ABV is kept low enough to allow fermentation to continue – in port the ABV is generally raised to about 20%. The characteristic sweetness of port is also a side effect of this, as there is a lot more sugar left in the wine than would normally be present after a longer fermentation – as the historical English taste was for sweet wines this makes perfect sense. One of the boats formerly used to transport barrels. 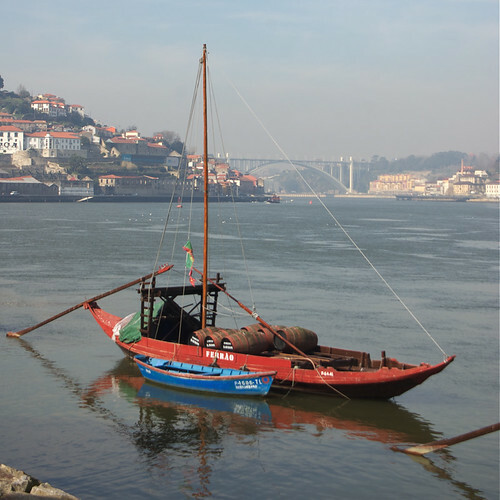 The next stage in port production is aging, which usually happens outside of the winemaking regions in the areas closer to the mouth of the river, originally to help with transport. 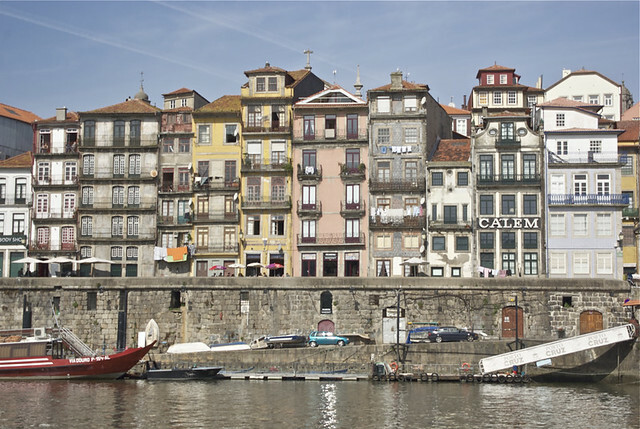 In ‘ye olden dayes’ the young wine was transported by barge down the river to Porto and its south bank sister city, Vila Nova de Gaia, where the vast majority of the port lodges and caves are located. The journey took about 8 days and the small boats could only carry about 40 barrels each, making it a rather labour intensive process. On arrival in Gaia planks would be pushed out to connect the boats to the waterfront warehouses and the hundreds of barrels from the flotilla would be rolled ashore – an impressive sight based on the photographs and paintings in the various port lodges. The last boats arrived in Gaia in 1963 and since then the less romantic transport method of tanker truck has been used.